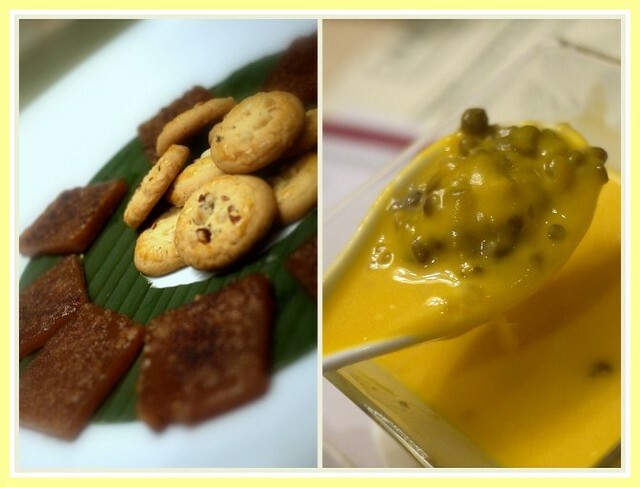 I was pretty excited when I was invited by Elegant Inn recently to try out one of their special menus which they have crafted in association with Standard Chartered Bank’s promotion for their credit card holders for the coming Chinese New Year. It’s always a thrill for me to dine at Elegant Inn since I discovered this gem of a restaurant last year. Since my very first visit, I had been bowled over by their fine HK-style Chinese cuisine and I have been back there several times with friends and family. I’m so glad to see that Standard Chartered Bank has included Elegant Inn into their list of 8 Top Chinese restaurants in the Klang Valley. Customised Extravagant 8 Menus have been specially prepared by their best chefs exclusively for Standard Chartered Bank credit card holders at a price of RM888+ per table of 8 pax from 20 January 2011 to 17 February 2011. 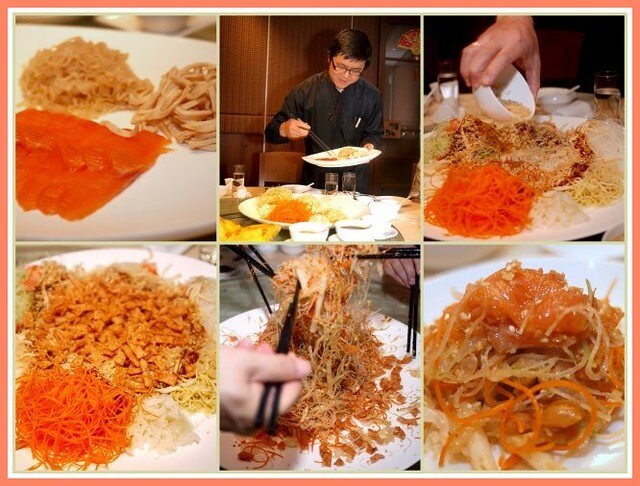 To usher in the Year of the Rabbit, what better way to start than to partake in the Bountiful Harvest Salmon Lo-Sang? Freshly-shredded cucumber, carrots, radish, ginger, pomelo, snow pear were tossed together fresh salmon, pearl clam strips and jelly fish. I like it that one of their service crew actually helped us to vocalise all the good fortune wishes as we tossed the Lo-Sang as high as possible (without messing up the table too much! )… it was pretty enlightening to learn all the correct Chinese phrases for prosperity, good health, great career, abundant luck etc etc. 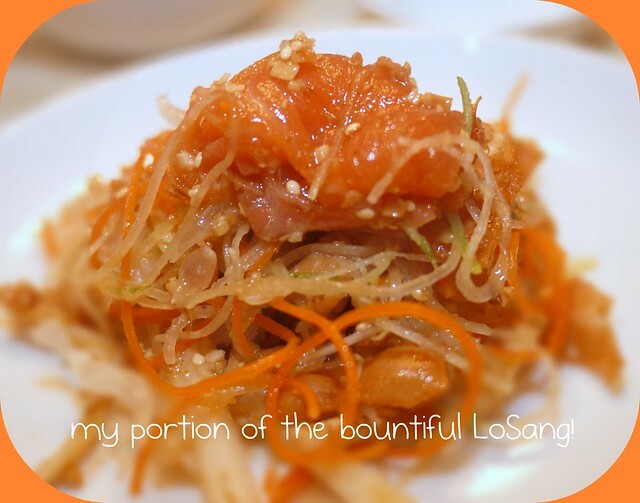 The sauce used to bind the Lo-Sang was light and refreshing – in fact, the whole Lo-Sang dish was light and refreshing with none of the cloyingly sweet, oily or overly-crunchy textures (as in, too much of crispies used) that some restaurants favour. Every mouthful was a wonderful mixture of gorgeous “mouthfeel” – fresh crunchy juicy vegetables + fruits, tender marine-fresh salmon, delicately chewy pearl clam strips and stringy bouncy jellyfish! The soups served in Elegant Inn are mostly double-boiled as this is the best way to seal in the tastes and flavours of the ingredients. In the double-boiling method, evaporation is minimised, thus reducing the loss of flavours, yet extracting the best from the ingredients used. 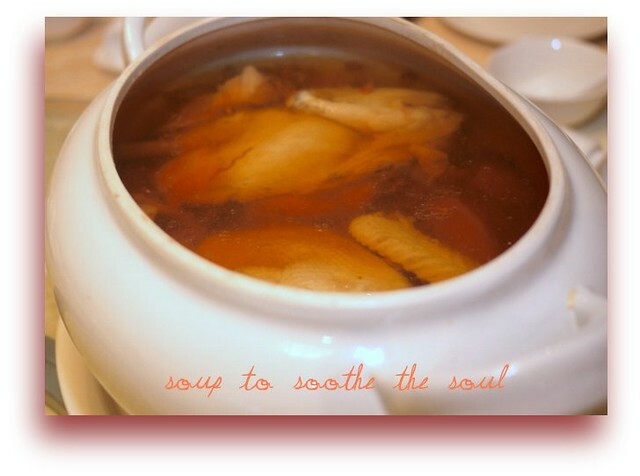 Double-boiled Village Chicken Soup with Cordyceps Flowers & US Top Shell subscribes perfectly to this, resulting in the sweetest naturally-flavoured soup. Cordyceps Flower is a valuable Chinese herb believed to help build the body’s immunity, particularly good for the lungs. A huge platter of the ingredients used in this soup – village (free-range) chicken, pork ribs, dried scallops, chinese ham, US top shell were dished out and served… still flavourful from the double-boiling! A thick generous slice of the giant estuary garoupa, fried to a golden hue and topped with chinese leeks and “har-kon” (dried prawn strips from Hong Kong) served with a light sauce made from superior soyasauce. 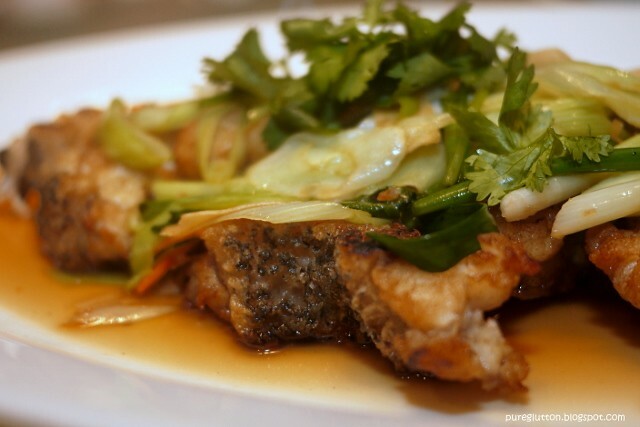 This is one of the best way to serve “loong tann” – as this rendered the thick fish skin to be both crispy & slightly chewy. A prized catch, this fish dish was a clear favourite (including mine) round our table that evening! I think the photo speaks for itself. Unlike most restaurants, the buttery salted egg yolks had been cooked in such a way that the rich flavours had been totally infused into the prawns, not merely coating their shells. I have personally watched their Head Chef, the dashing Wesley Ng, cooked this dish – how the salted egg yolks were meticulously & painstakingly cooked with butter and then skilfully immersed into the fresh succulent prawns, resulting into a decadently rich dish – they don’t label this their “signature style” for nothing! The whole cooking process of their signature Eggyolk dishes (it goes very well with crabs, too) takes not less than 20-25 minutes by Chef Wesley Ng! Prior to this dinner, I had actually tasted their Golden Boneless Stuffed Chicken with Chicken Tomato Salad and my family members couldn’t stop raving about it. 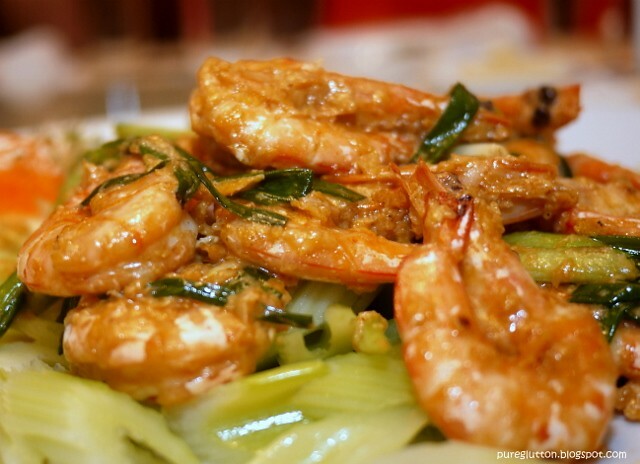 It is rather an “old fashioned” dish, favoured in many traditional Chinese restaurants. It is pretty labour-intensive as all the chicken meat had to be stripped off and usually a fish paste is then replaced on the chicken skin and fried. Elegant Inn’s version is one notch higher – prawn paste is used instead. Imagine a layer of golden crispy chicken skin over a marine-sweet layer of tender, succulent prawn paste, fried to perfection. At the sides, you will find freshly-cut tomato wedges, topped with shredded chicken meat and doused with a delightful orange balsamic dressing. One word to describe this dish? Dropdeadyummy. 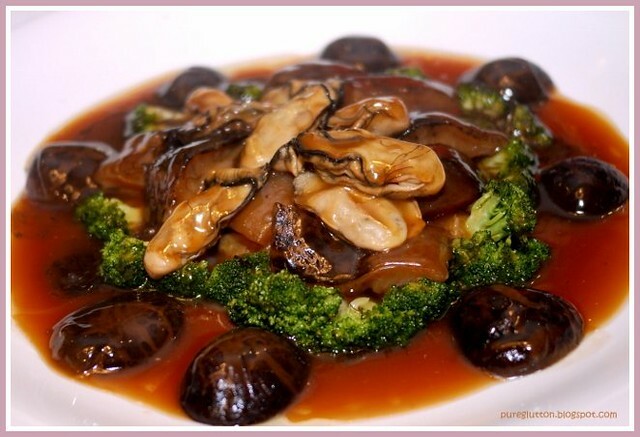 Thick slices of sea cucumber, fat juicy Japanese oysters, plump Chinese mushrooms – there is no stingeing on good quality ingredients here. A very typical Chinese New Year dish and Elegant Inn’s version was excellent, down to the very last drop of the delicious gravy! Just when we thought we couldn’t possibly eat another morsel, Braised Seafood Rice with Australian Scallops & Fresh Crabmeat was served, amidst “oooh’s” and “aahh’s” from the diners at our table. Look at the photo and you’ll understand where the “oooh’s” and “aahh’s” came from. See those generous chunks of scallops and fresh crabmeat? Is it any wonder that this entire plate was wolfed down, despite everyone being “so full” prior to this??! No matter how full one is, there IS always room for dessert. Try and challenge this, if you dare, haha! – a perfect end to a perfect meal. To all you Standard Chartered credit card holders out there: All I can say is, you are in for a great meal with this Extravagant 8 Menu in Elegant Inn – a meal extravagant only in the value and freshness of the ingredients used and the culinary skills employed; a meal well worth the RM888++ tag. Dining here is an art and an experience in itself. I say this not because this was an invited review but because time and again when I dined in Elegant Inn, the experience has always been memorable, in a most delightful way. Elegant Inn also has a variety of their own special Chinese New Year Menus to offer… and some of these dishes featured here are available in their other CNY menus as well as on their A La Carte menu. * Reservations are strongly recommended! Oh my, I'm gonna kill myself for missing this dinner. 🙁 Your pictures are gorgeous. 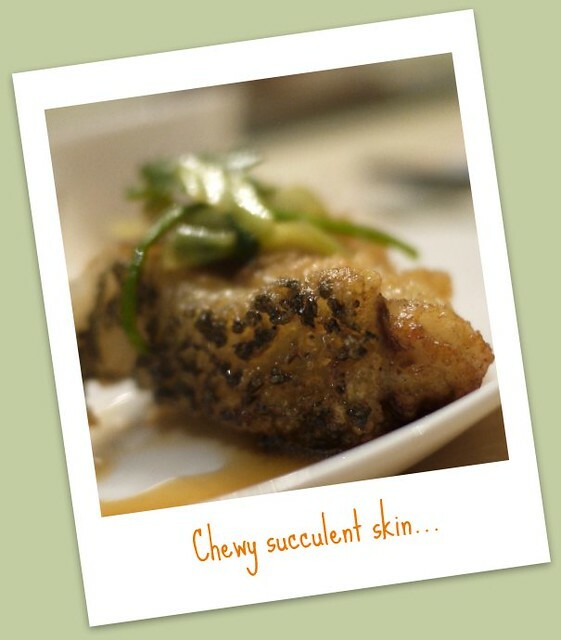 I've always liked Elegant Inn for its wonderfully prepared chinese food. i always love this restaurant for their food and ambiance.. but i have yet to meet the handsome Wesley Ng!! Oooh, hungry looking at the pixs. Everything looks so good. This will be my reference point when I return for CNY makan at Elegant Inn! Can't wait to try the fish. 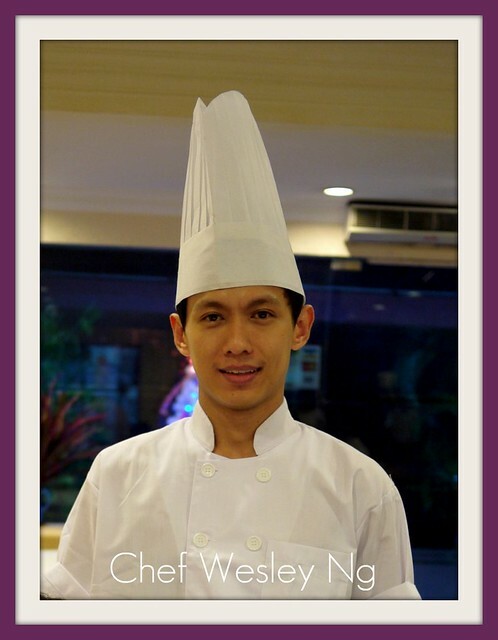 Connie: I see you are a fan of Elegant Inn 🙂 Oh next time you are there, just ask to meet Chef Wesley – I'm sure he'll oblige if he isn't crazily busy in the kitchen, hehe! Boo: Yes, we don't mind going again & again hoh?! J: Not only "look" yummy, the food ARE yummy! Ciki: Jom, we go again hehe! Argh … should have gone with Jason that evening. Elegant Inn's food seemed different from the usual Cantonese fares huh? 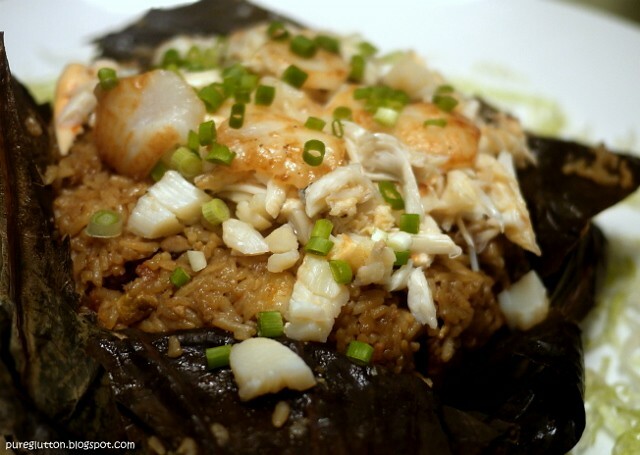 There will definitely be room for a bowl of the Braised Seafood Rice :)…thanks for sharing the menu. J2Kfm: Hehe, ya u should have gone! 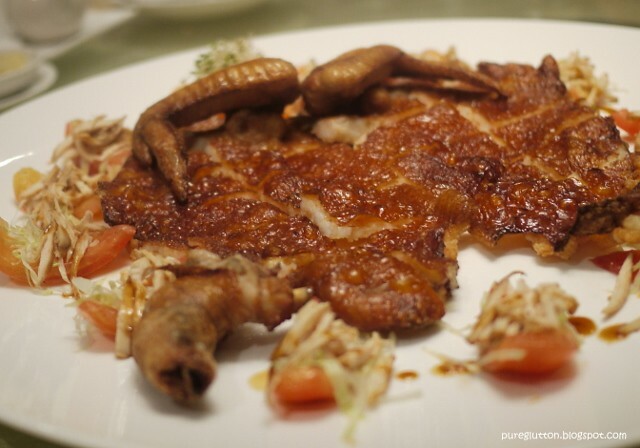 They serve HK-style Cantonese fare – yummy. CK Lam: Hey, nice to hv u drop by here! Yep, that seafood rice was really good. Babe_KL & KY: Oh yes, it was a really good dinner eh!